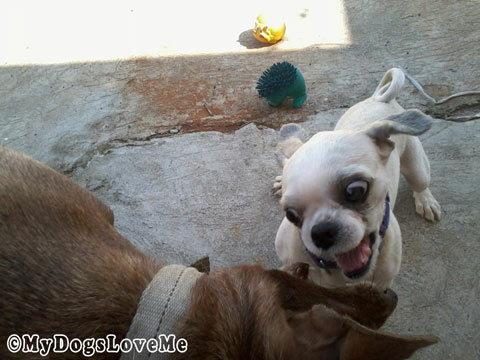 My Dogs Love Me: Almost Wordless Wednesday: Lights, Camera, ACTION! Almost Wordless Wednesday: Lights, Camera, ACTION! Yes, we are guilty of being away for some time. My beau came to visit me at my sister's so I've been a bit occupied. Moreover, I was troubleshooting the newly built house's Ethernet network. In short, I was busy busy busy ^^. So enough of my whining and let me present to you our latest adventure shots. You'd think Shih Tzus were bred to have the decency to respect the bigger dog. Buchi doesn't mind being toppled or trampled by Rin. This is what play time is in the morning. Yes, we have morning and evening sessions. Nope, I doubt Buchi understands the concept of "I, Big Dog, Squish Small Dog." Morning playtime is right after potty time. Buchi is on a leash when he isn't done pottying because he will leave presents EVERYWHERE. Good thing Rin is such a gentle giant. She puts up with the small annoyingly ambitious dog. Have a great Wednesday. We promise to make it up to you guys as soon as I can find a longer time to sit in front of the computer other than my meal breaks. 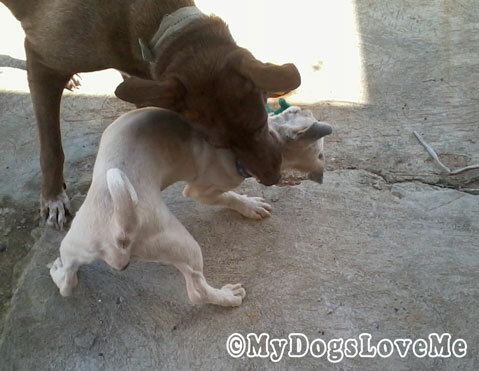 We always play with big dogs....they're so much fun and they don't know that we're REALLY big dogs anyway! Ditto Magic. Have a great Wednesday. I looooooove those action shots!! Looks like a ton of fun! Great action shots! See you soon. Ohh, looks like an epic battle. Glad to see the cuties were just playing. Buchi, you no is a small dog. You just has correct-sized legs. Like me! How very true - all the little pups we meet on our walks have no fear at all of the bigger pup. It sure looks like lots of fun going on there. OMD...they look like they are having soooo much fun! We wish we had a little dog to play with! Buchi, what HUGE eyes you have! I don't think I would want to see those coming at me at night! BOL! It looks like you two know how to have a good time. Great play shots! I would have loved to join in the fun! Yay to your mom for having her beau visit! I hope they have a wonderful time. And good luck to your mom in fixing the ethernet. Play time looks pretty fun, if you ask us! Glad to hear that Rin is a gentle giant, because he looks to be EATING Buchi in that first picture. LOL! LOL, great pictures. That first one looks like he is getting his head bitten off! It is cool how bigger dogs are so gentle with little dogs. We could all learn from that. I think animals are not tuned into sizes! Kittens are that way too. They are so small but don't seem to be aware of it. Like they used to say in the girl's locker room...size doesn't matter! Looks like both are having fun. LOL! That 2nd picture of Buchi just about to nom off Rin's nose is so funny! Those look like some fun play sessions. Now that Apache is gone not as much play time happens around our house. For some reason Stetson and Linus mostly play separately with their toys and not together. Maybe it's time for another puppy! 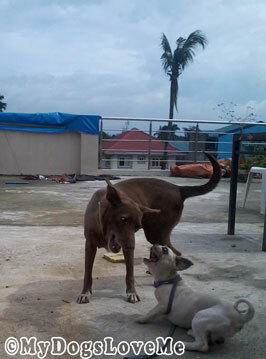 MOWZERS, Buchi, you're FEROCIOUS! MOL!